All The World's a Stage. 1500 Pieces. Finished size: 24" x 33". Artist: James Christensen. I am a theatre director. Perfect!!!! If you, or someone you know is a Shakespeare fan, I recommend this challenging puzzle. 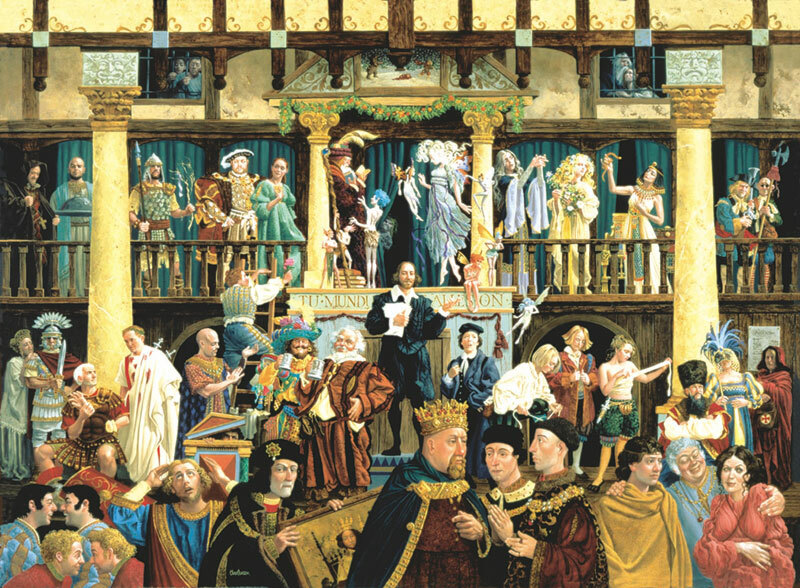 Once completed, there are numerous characters from difference Shakespeare plays to identify. Sometimes pieces appeared to be in the correct position. However upon further progress, we realized some pieces were wrongly placed. There are also a lot of pieces with similar coloration, adding to the difficulty. I'm working on this puzzle now and I love it! Beautiful colors, excellent quality and just really fun to do! I'm excited to receive All The World's......my husband is an avid Shakespeare fan. This is definitely a 5 star winner. Lots of fun to put together and beautiful when completed. A must have for Shakespeare lovers.